Natale and Paul celebrated on Monday 13th February after graduating from Goldwell’s world class Colour Expert education programme, in London’s Mayfair. Colour Expert is an intensive 6 week diploma that forms part of Goldwell’s world class education programme. It provides all the technical and business skills needed to manage a successful salon, inspired learning and personal development, and pushes its delegates to another level in terms of colour expertise. As two of only a handful of UK hairdressers per year to achieve this diploma, joins an elite group of Goldwell Colour Experts, who have been educated to level that few can boast, and can consider themselves masters in colour. 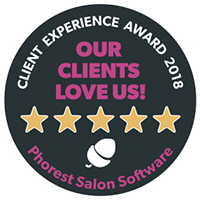 At Cienté we strive to provide the most professional service, latest techniques in hair, and the best stylists – so to have certified Colour Expert’s in our midst is a great achievement for the whole team. Well done Natale and Paul. To book your complimentary consultation or arrange an appointment with Natale or Paul , call Cienté on 01442 877273.